In the premium tobacco industry, new blends often commemorate one anniversary or another. Such traditions transcend industry boundaries. 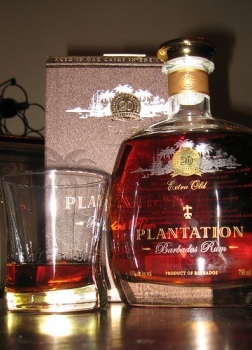 Plantation 20th Anniversary Rum, for example, celebrates Alexandre Gabriel’s two decades of leadership over Cognac Ferrand. Each vintage is named for its locale of origin: Barbados, Grenada, Guyana, Jamaica, Nicaragua, Panama, Trinidad, and St. Lucia. Over and above these, Plantation 20th Anniversary is the flagship rum from Cognac Ferrand. It is made from the company’s oldest Caribbean reserves in Barbados, aged in bourbon casks in the tropics, then matured in oak in France for an additional 12 to 18 months. “This double aging process brings an incomparable smoothness and fullness to this rum,” reads the spirit’s ornate box. Ever since I discovered it a few weeks ago, Plantation 20th Anniversary has become one of my favorite rums. Its superior quality is evident on the nose, which is creamy and rich with a butterscotch-like character. On the palate the spirit is very complex. Notes as varied as coconut, vanilla, orange peel, cinnamon, banana, and warm tobacco are evident, and they linger for quite some time in a warm finish. The price tag of $40 for a 750 ml. bottle is no small expenditure, but I’m more than convinced that Plantation 20th Anniversary is worth the cost. What a finely balanced, multifaceted rum this is. For maximum enjoyment, pair it with a mild-bodied cigar that will play off of—rather than drown out—the spirit’s exquisite subtlety. Sounds like a nice rum, but the real test is how does it stack up to my current champs: Zaya and Zacapa? I would rank Zaya, which costs about the same as Plantation (perhaps a little less), neck and neck with Plantation in terms of quality and taste. Maybe a slight edge to Zaya. Zacapa is another outstanding rum. You can't go wrong with any of the three, but if I absolutely had to rank them, I'd place Zaya first, Plantation 20th second, and Zacapa third. Just one man's opinion, though…. I always liked Ron Zacapa better than Zaya… so clearly you have no idea what you are talking about… just kidding! Glad to hear you consider them all close. I'll have to try the Plantationn and make up my own mind. Love the rum debate. Personally I'm partial towards Zacapa over Zaya, but only slightly. I haven't tried the Plantation 20. Of the rums I've tried, the only one in the Zaya/Zacapa class is the El Dorado 15 (which will be the subject of a future Stogie Spirits). I’m typically a bourbon drinker, but made a conscious attempt to navigate my way through a portion of the rum world for a trip to the Caribbean (which I just returned from). Of all the rums I sampled prior to, and during my time on the islands, the Plantation Barbados was my favorite. Many of the smaller scale, local rums sampled on the islands were delicious and unique in their own right, but lacked the smoothness and complexity of the Plantation (IMO at least). I’m actually enjoying a glass as I type this (paired with a Perdomo Habano Conn., which is complimenting nicely thus far). Love these reviews – Keep up the good work SG’s.